It’s a shame Maurice Goldstein is off the market. 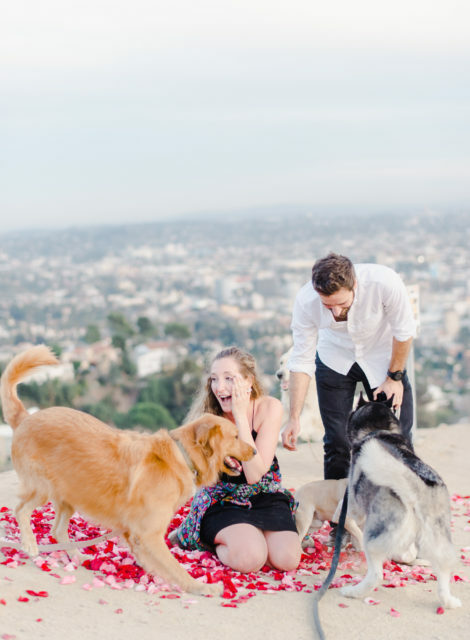 Based on his recent proposal to girlfriend of four years, Laura Stampler, he’s going to make one heck of a husband! 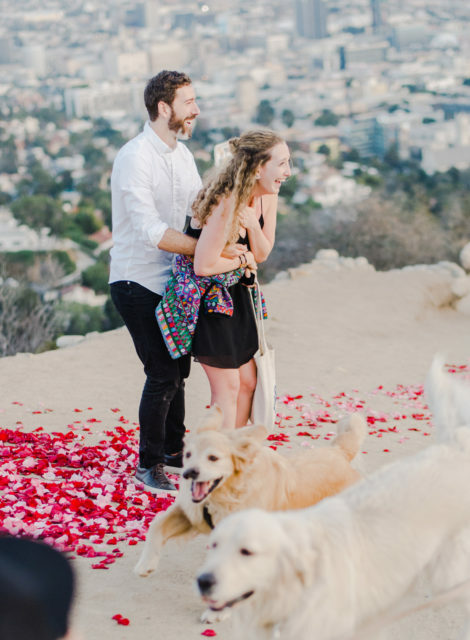 Not only did Goldstein blanket a mountaintop in rose petals, he also hired an a capella group to belt out Stampler’s favorite Disney and Motown hits. Pretty amazing right? Well brace yourselves, it gets better. 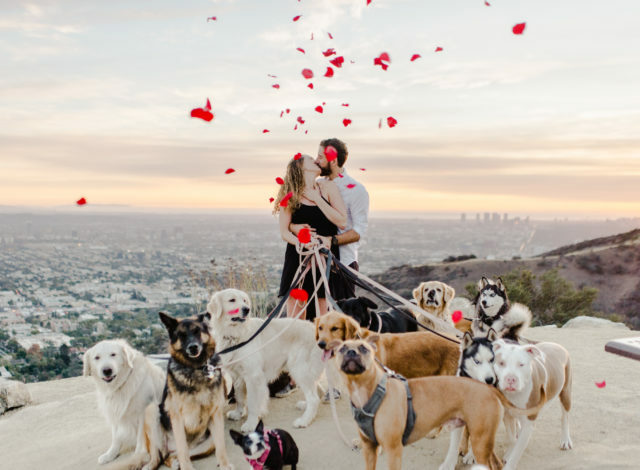 For the pièce de résistance, Goldstein arranged for 16 dogs to crash the proposal at just the right moment! 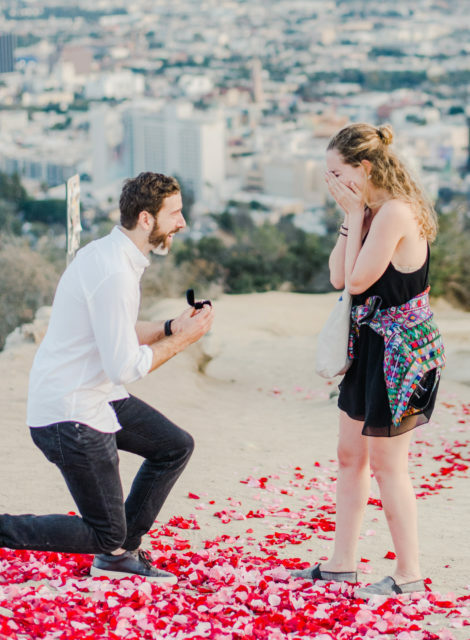 The couple currently lives in New York City, but the proposal took place in Los Angeles while they were in town visiting family for the Thanksgiving holiday. Goldstein asked Stampler to join him for a hike in Runyon Canyon Park followed by drinks with friends. Stampler realized something was going on about 15 minutes into their walk. 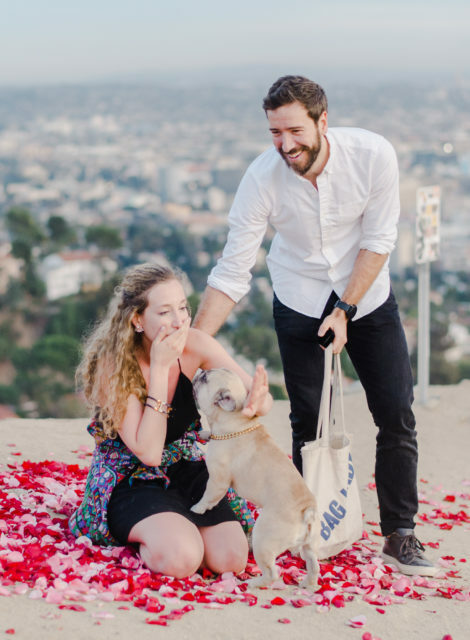 Before she knew it, Goldstein dropped to one knee and popped the question! 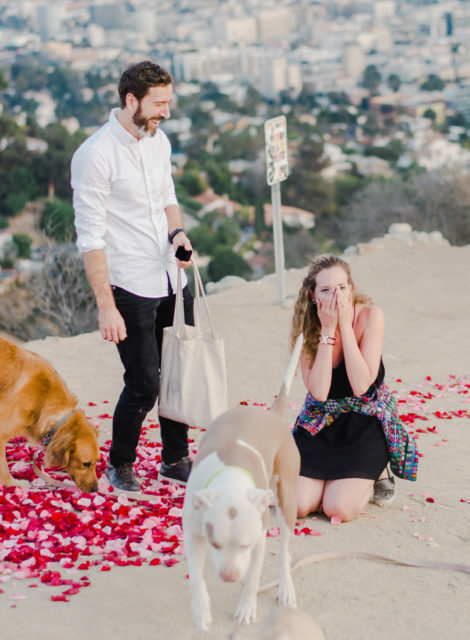 Stampler said yes, and the couple kissed as the a capella group sang. It was perfect… but there was one more surprise yet to come. 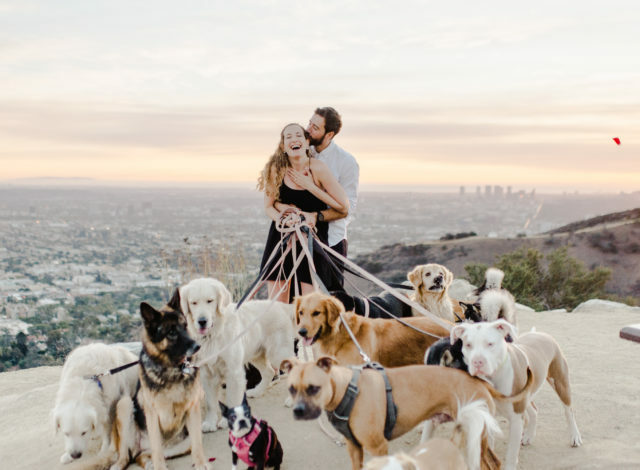 “When we were kissing, all of a sudden all of these dogs were unleashed and started running towards me,” Stampler shared. 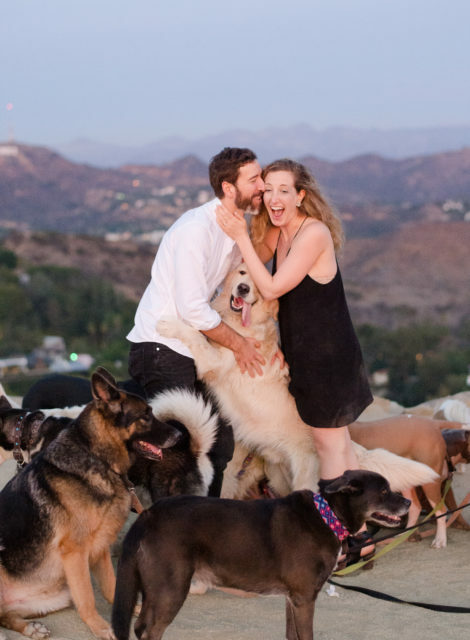 Luckily, friend and photographer Rebecca Yale was there to capture every moment. Stampler was so distracted by the herd of canine cuties she forgot to put on her new ring! 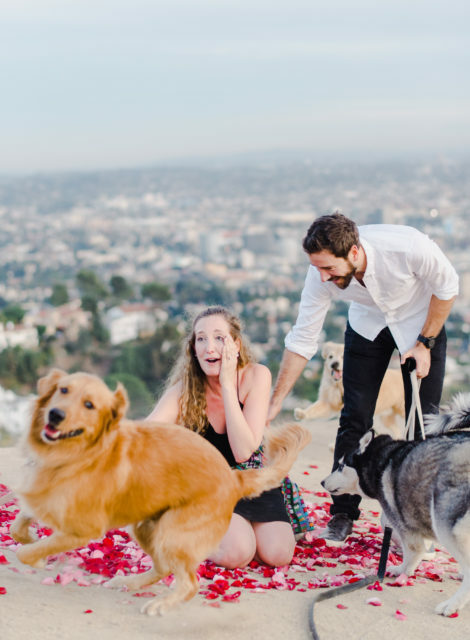 Once she had a chance to process the scene – and cuddle all the dogs – she learned the details behind the magnificent surprise. According to Stampler, the day was everything she dreamed of and more. The couple plans to tie the knot in the fall of 2019 or the spring of 2020. Until then they will get their fido fix as foster pawrents for the NYC organization, Muddy Paws Rescue.